I've never tried any products from Sleek but I hear amazing things, particularly about their shadow palettes, so I’ve been thinking of making a purchase. And now my order is going to be that little bit bigger because I cannot wait get my hands on their latest offering, this gorgeous, multi-coloured eye primer palette. Look at it! Fabulous!! Just imagine the short work this little piece of kit would make of achieving the perfect smokey eye. As soon as I heard about this, the words of the Guardian's beauty columnist, Sali Hughes, started ringing in my ears: in this video, she tells us that the secret to a smokey eye is a mix of consistencies, so to always use either a powder base with a cream shadow, or a cream base with a powder shadow. TADAAAAAAAAAAA! 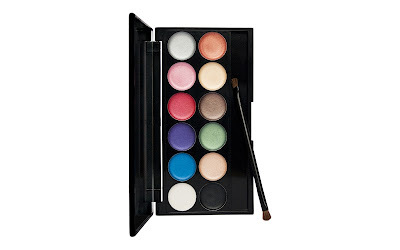 So this is billed as the ‘first professional primer palette’ and is designed for use with the Sleek i-Divine shadow palettes – I’ve just spent about twenty minutes drooling over the selection on their website – though you could, of course, use them under any shadow in your collection. The primers promise to take your eyeshadow to new levels of intensity, ensuring the perfect base for amazing colour that will last all day long. Apparently, the highly pigmented, long lasting formula is what sets this apart – that, and the selection of 12 creamy shades, ranging from bold brights to neutral classics in both warm and cool shades. You apply it with the brush provided, sweeping your chosen shade over the eyelid and immediately following with shadow. The super smooth texture promises to glide on effortlessly without creasing, making it the perfect base for your favorite shade. The i-Divine Primer Palette will be available from Superdrug in the UK from February 16th and I’ve emailed the brand to find out if the same applies in Ireland. I’ll update this post when I have more information, but in the meantime, from next Wednesday you can get your hands on it from the Sleek website, where before delivery it'll be priced at a very reasonable sounding £6.99. Have you tried anything from the brand and what were your impressions? Are you as excited about this little beauty as I am?! Is it just me or is that woman in the video very annoying? Heya Emma - Sleek's not sold here, more's the pity. I've asked them a couple of times via Twitter and they don't seem one bit interested in the Irish market either, gah. But you can buy from the website and shipping is reasonable, so that's something. Appreciate the info Kirstie and thank you for stopping by! Such a pity they don't seem interested in the Irish market but good to hear shipping is reasonable, as I don't think I can resist this primer palette...!